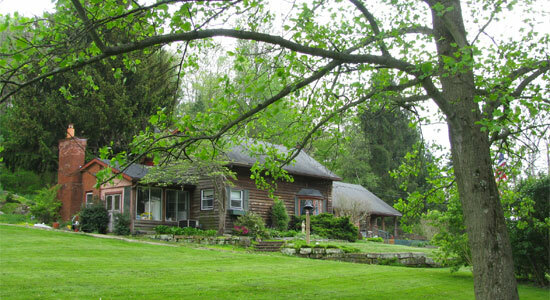 In a post written on the first day of May (How to Dream a Writing Retreat Into Your Life), I announced that I was leaving the next morning for a writing retreat at a B&B two hours down the road in Ashland, Ohio. I said I would be staying for two nights and I called it a mini retreat. That post was all about how I’d been dreaming of a week-long (or maybe even a two-week-long) retreat so I could start a new book. I talked about how finances ruled out that kind of expense for accommodation and how Brian came up with the suggestion that I go for just a couple of nights. So I did. Even with this low-key plan, things turned out differently than I imagined they would, and on just about every front. I did not end up using the privacy of my room at College House B&B to write for hours on the computer, as envisaged. I mostly wrote on a beach towel in the backyard or stretched out on a wicker couch in the sun room. And I mostly wrote by hand in my journal. I did not end up writing the book I went there to start. After a yummy and eye-catching breakfast on the first morning, the B&B owner Cathie said something during a long conversation that gave me an idea for an entirely different book. 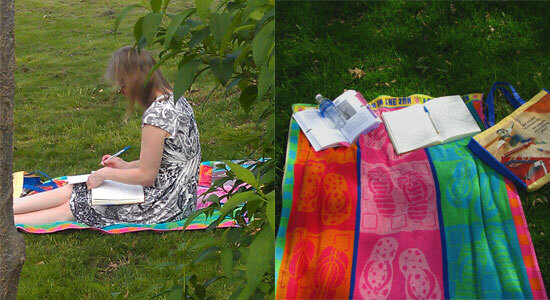 I laid my beach towel in the freshly-mown grass and started journaling. All kinds of material I didn’t know had been hanging around inside my head poured out. 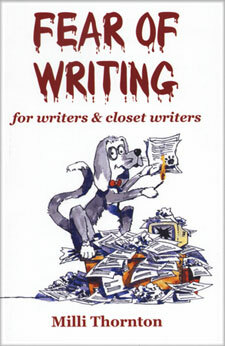 It was fun to journal about it first from various aspects without having the pressure of “writing the book.” I’ve decided to adopt that as an enjoyable approach to any book I might write in the future. I soon realized I would need a special house for the new book. I started making bullet points to represent aspects of the house that would suit my main character’s needs and personality. An hour later I was in the dining room making tea when a particular brochure in the tourist info rack called out to me. I saw that Malabar Farm, once home to novelist and agrarian writer Louis Bromfield and now a historic landmark, was only about 30 miles away. The farmhouse at Malabar had been added on to with great ambition and style by Bromfield during the 1940s and is now open to the public for tours. It looked like the perfect model to help me flesh out the kind of house-of-many-rooms built by an eccentric owner that I was creating in my journal. I knew I didn’t want to copy the exact style of the house (my character is very different from Bromfield and his interests) but I needed the physical act of walking through such a house to help me visualize it more clearly. Angelwoods was exactly the quiet I’d been craving that was never quite possible at a B&B in the middle of a suburban neighborhood in a town full of the usual noises. At its name suggests, Angelwoods really was out in the woods. It was also surrounded by herb and flower gardens and buzzing with the biggest, fattest bumblebees I’ve ever seen. The tour of the house at Malabar Farm was fascinating and I was totally enthralled with the tour guide’s historical and anecdotal monologue. I also partook of the farm tour, conducted by tractor. After that I had a wonderful time in the visitors center choosing some novels by Bromfield, as well as some Heritage Playing Cards (Spices, Insects & Spiders and Reptiles & Amphibians) to play around with and inspire me visually as I write the book. I was lucky to be adopted by a staff member at Malabar who gave me some research materials that he’d compiled himself, and which were not available in the store. He also surprise-gifted me with a pencil drawing he’d done of the statue of Lord Ganesh that sits in an alcove above the front door of the farmhouse. Lord Ganesh is an Indian god with the head of an elephant and he’s known as the Remover of Obstacles. (Bromfield spent time in India, one of his novels is set there and Malabar Farm is named for the Malabar Coast in India.) I had a previous interest in Ganesh so this almost seemed psychic on the part of the staff member. At Angelwoods I met a lovely couple from nearby Cleveland. This led to all kinds of plans to get together based on various interests we share. We talked for hours. Somehow, in the middle of all these interesting episodes, I managed to do some writing in a comfy armchair in a room overlooking the garden. 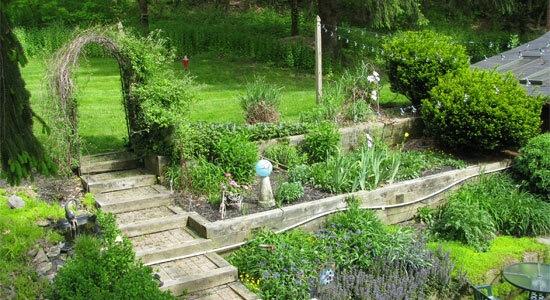 I also wrote on an upper deck, where I had this view of the herb garden. By the time I left Angelwoods my senses felt full to the brim and I thought I was ready for nothing but the familiar routine of home. But the adventure wasn’t over yet. 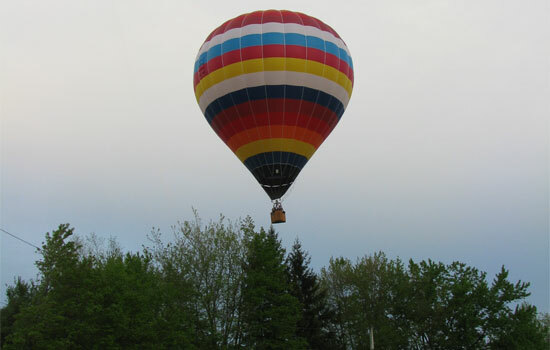 About 30 miles from home, when I was back on familiar roads, a hot air balloon sailed over the tree tops. I pulled over, hopped out of my car and managed to get some photos just before it landed behind a house. We’re talking farmland Ohio, where you don’t expect to see exotic sights like hot air balloons—I should have taken it as a sign that my writing retreat wasn’t finished with me yet. But I didn’t realize that until after I was home and Brian left for a business trip. I had the house to myself, I was hot on the trail of a new book . . . what else is a writer to do but continue her retreat? Strangely, this part of my retreat felt the most like an actual sanctuary where I could write undisturbed. I occasionally interrupted my writing to fulfill some creative commitments (such as helping my writing students or making a new post on my travel blog) but for the most part I stuck with my journal and let the story unfold. What unfolded was not at all what I expected from the book idea. It turned out I was afraid of a particular room in the imaginative house I was creating. (Oh, dear. Sounds very Freudian, doesn’t it?!) The room represented an emotional wound I had sustained as child and which I had never been able to resolve, no matter what I tried. The deeper I went into the contents of the room, the more I realized I wasn’t ready to write the book. I need to resolve the issue first. And my writing gave me plenty of clues on how maybe, at long last, I can do that. At one stage I became very distraught at the idea that I couldn’t just write the book as a way of resolving the old wound. 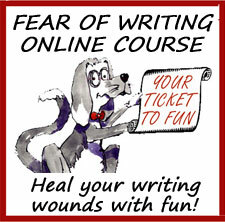 After all, that’s what I did for my own fear of writing when I wrote my first book, Fear of Writing, so surely it should work again. My journaling finally helped me see that you can’t always force an issue to work itself out the same way that something else did. This one requires its own unique resolution. Besides lots of writing and some walks in the sunshine, I took lots of afternoon naps and slept 10-12 hours a night, which felt very retreat-y. It also fed my writing with a certain serenity that doesn’t happen when life is busy, busy, busy. All up, my adventure lasted for 12 days. My “mini” writing retreat morphed into so much more than I’d been expecting. I could not have planned it to happen that way—not if I wanted to make all kinds of magical (and sometimes emotional) discoveries that led me much deeper than I could have dreamed up to fit a travel itinerary. Or a writing agenda. I also learned some valuable things on a practical level (such as what doesn’t work on a B&B retreat) that I plan to share with you in my next post. 42 Comments - Leave a comment! Wow Milli, sounds like quite an amazing experience. I was wondering why we hadn’t heard anything from you for a while. So glad you had a productive couple of weeks, even if it wasn’t what you intended. PS. Angelwoods looks incredible! I want to go! Thanks, Jo. It *was* pretty amazing. Wow Milli! This is a great post, very inspiring…makes me feel that in real life, it works to start something and then go with the flow and straight into productivity instead of struggling to stick to a predetermined goal and path at the expense of creativity! And Angelwood looks and sounds awesome! Just my kind of place! I’m pleased you found my story inspirational. WOW, what a trip! It truly sounds like you traveled further afield than a few hours’ drive, Milli. I got shivers when I read about the man at Malabar gifting you with a drawing he did of Lord Ganesh. I don’t think there’s any ‘maybe’ that it was a sure sign from the universe to support you and your muse on this fantastical literary exploration. Thanks for being such a great example of how to spontaneously follow the muse and sharing what mystical wonderment can happen if we let ourselves do just that. I LOVE this story. How wonderful that you were able to stay in the flow and let things unfold–and how amazingly they unfolded. It really does show what can happen when we take baby steps to our dreams. Lois, I believe you *will* go on a writing retreat. Even if it ends up being at home. As for doing it when the family’s away, well, there’s just Jeff and me here now, and I don’t seem him going away any time soon! 😛 But I plan to start looking for ways to make this a reality for me. I need it! Lois, I figured you would say that (about not foreseeing Jeff being out of town any time soon). But since you’re home most of the time anyway, it sounds like a retreat somewhere else might be better for you. It can certainly be highly inspirational to change your setting! I just had an idea. Since you want to start looking for ways to make your own writing retreat a reality, feel free to guest blog about that process here on FoW if you want to. You could go back first and read my previous post (“How to Dream a Writing Retreat Into Your Life”) for ideas to kick-start you. And then just follow any threads or clues that come up as you explore the possibilities. I’ve found that most clues or signs that come to me can be explored at no cost – and looking things up on the Internet can lead to things I might not have thought of on my own. Plus, writing about it while you’re going through the process might make something magical show up too. That’s what happened for me when I started to journal about it. We already know how writing can draw things out of our imaginations that we didn’t know were there. I’ve found that to be true of solutions, as well. Yes, exactly! I find myself wondering how much it would cost to go to Montana for half a week. It could happen! Wow, Montana. What a cool dream, Lois!! Did you know I lived in Great Falls, Montana from the age of 6 months till we left for Australia when I was 12? I’d be so jealous if you went to Montana for a writing retreat, I might have to dream up a way to get there myself. LOL!! Haha! I do believe I remember you mentioning it somewhere! 😀 I’d totally forgotten. I’d love to see St. Marie, since that’s where Lucky Raven ends up settling down with his wild Mustang sanctuary. 🙂 But the mountainous western region would be awesome, too! Awesome that you’ve got a very personal reason from your own writing (and one of your dearly beloved characters) as a way to help you pinpoint where you would dream of going on a retreat. This is going to make for a very interesting story for my blog readers if you do decide to write about it here. I look forward to beginning the exploration and seeing what happens. What a great retreat and trip! 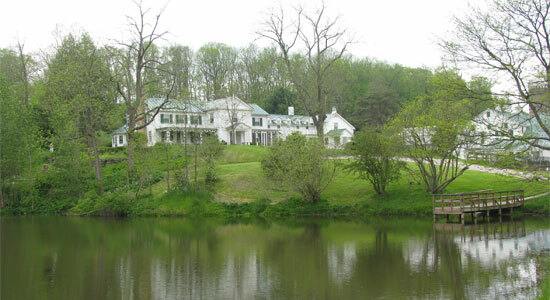 I would love to visit Malabar Farm, it sounds so cool! 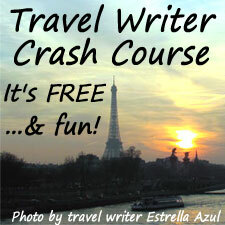 I’ve never gone on any kind of a writer’s retreat, but now I want to try to plan one!! Julia, you definitely would have loved Malabar Farm and I thought of you while I was there. 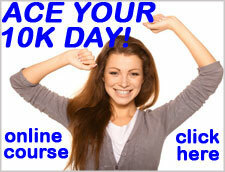 I’m thrilled to hear you want to plan your own retreat! Please keep me in the loop if you end up doing one: I will be avid and eager to hear all about it. Annie, I totally agree that being “elsewhere” can be mega inspirational. I was so inspired during the two B&B phases of my retreat (plus the Malabar Farm tours) I was in a constant state of IDEAS. Yippee! Thanks for the link. Can’t wait to read about it. Heaps and heaps of good luck with your dreams! I hope your two friends will want to go again in six months or so. But in the meantime maybe there’s some smaller plan you could try on your own? You never know what can emerge from even a very modest plan, as I so magically found out! Do you feel like Alice in Writerland? Sounds like an adventure on such a level, including the psychological twists and turns we never expect! Bravo! Alice in Writerland. I love it! It sounds like nothing less than something you would say. And you pegged it, woman. 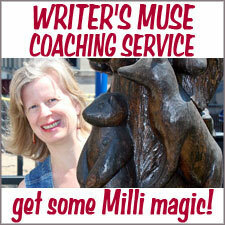 Sounds amazing, and my gosh, Milli, I’m so happy for you – for getting a 12 day writing retreat instead of just the two days you started out with! Aww, what a sweet comment! Thank you! Like others commenting here, I had been *wondering* how your retreat went. And as others have said, wow. Wow, wow, wow. This is such a good reminder that sometimes you can be looking in one direction but your path lays in another, if only you let yourself be free enough to follow it. A new story, new insights, rest and renewal. It sounds like a powerful 12 days. Can’t wait to keep reading more about this journey of yours. Lisa, thanks for all the wows! Reading the comments made here has given me a whole new appreciation for how I did manage to let things play out from my inner self as an outer journey. Yours just gave me another eye-opener. I was often aware I was doing that *while* I was doing it (only for moments at a time and it never felt self-conscious) but now that I’m back in the groove of my usual routine I didn’t think I was on the same journey any more. But maybe I still am. I think I’ll use that as a line of questioning in my journal, to let my inner self tell me. Apart from the practical tips I’ve promised for my next post, maybe there’s more I can share with my readers that hadn’t occurred to me I might need to share until I read your comment. Thanks! I love the twists and turns of this story! Inspiring and fun reading. I’m doing a three-day at home writer’s retreat next week in conjunction with the 10k writing day, and have no idea what to expect. Which is just the way I like it. Sounds perfect, Deonne! You’ll be the first 10K participant (that I know of) who will be doing it in the style of an at-home writing retreat with some extra writing days on either side. I’ll be curious to hear all about it! What a great adventure! Kudos for your extended muse date. You already experienced enough inspiration to write a great post, and I’m sure much more than that. Milli, I love this story! Sometimes it seems like magic is just waiting impatiently for us to allow it to unfold. Today in 1945, Humphrey Bogart and Lauren Bacall got married at Malabar Farm, the home of Bogie’s close friend, Pulitzer Prize-winning author Louis Bromfield. Caroline, that’s exactly the kind of serendipity that kept happening! Amazing when it even spills over onto one of my blog readers. What a wonderful retreat you had!!! Don’t you love it when we just go with the flow of things and let the Universe guide us? I need to do more of that myself! 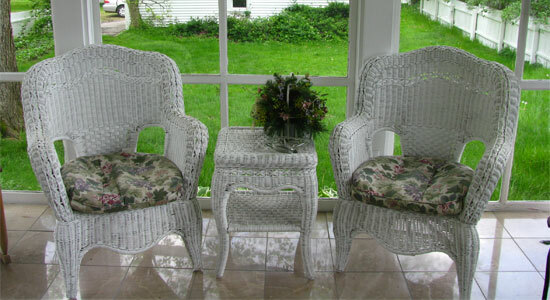 The photos of the B&B’s are lovely. I’m so happy that you had an enjoyable, enlightening time! Valeka, I totally agree. If only we could remember to go with the flow more often. I was truly lucky to do it for 12 whole days. I’m pleased you like my photos! Milli- this retreat sounds like it was WONDERFUL… I’m always amazed at the level of creativity that seems to release when we relax and “let things go.” Can you believe I’ve NEVER been to a B&B? (Your green, lush grass is making me a bit homesick for Ohio, I have to admit). Melissa, thanks for coming to read about my writing retreat. (Was secretly hoping you would. :D) I’m terribly behind on blog comments but wanted to come back here and tell you how excited I was to read that you finished your WIP! Yay for awesome writing machine women in the desert! With hummie cams! Can’t wait till the day I can hold your novel in my hands and bury my head in your delicious words. Wow – what a great experience. 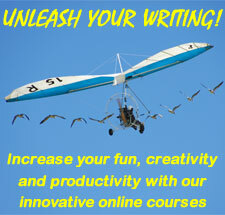 There are some things you just can’t force – in writing and life. I’ve discovered when I try to force, nothing works, but if I go with the flow….it always works out the way it was meant to be. I’m glad you enjoyed the retreat and it sounds just lovely!